The hellebores are beginning to stand upright, although I am on my knees to get as up-close to the stunning blooms as I can. Come out over the next few weeks to a month and have a look at the collection we are most proud of! 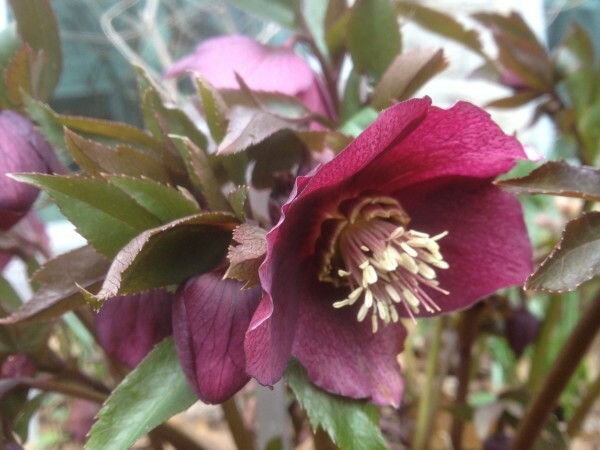 Shown here, Helleborus ‘Heritage Strain’ (Lenten Rose) in the West View Terrace. Part of our hellebore collection can be seen in the Demonstration Courtyard; seen here Helleborus x hybridus ‘Southern Belles Strain’ (Lenten Rose). Also in the Demonstration Courtyard, Helleborus x hybridus ‘Double White’, still hiding under last year’s foliage. I am always going-on about Helleborus x hybridus ‘Blue Lady’, well here is her counterpart Helleborus x hybridus ‘White Lady’, in the Entry Garden near the straw bale shed. Speaking of H. ‘Blue Lady’, take a look at the many clumps in the Entry Garden from the Floral Hall Courtyard patio. We have well over 29+ different hellebores in the garden, but this week a bright yellow gem throughout the West View Terrace has everyone’s attention, Iris danfordiae (Iris). Crocus are also beginning to steel the show; here Crocus ‘Gypsy Girl’ (Snow crocus) in the Entry Garden. Another jewel which opened today, Erythronium dens-canis (Dog’s-tooth violet) in the Garden Hall Courtyard above the waterfall. It is best seen from the link inside.